The Filson Sportsman’s Bag 266 is a well-thought-out design that makes a great choice for travelers and sportsman alike. 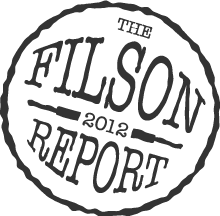 It is loaded with Filson’s classic style, but more importantly, it really delivers on function. Layout: (1) main compartment with (2) snap dividers; (2) large exterior compartments with zipper closures and organizational pockets/sleeves; (2) large end pockets; and (2) full-length stow pockets. This bag includes two twill dividers (with three snaps on each side) that can be configured in a number of different ways. I typically only use one divider in the main compartment to seperate shoes from clothes or dirty clothes from clean. I like being able to quickly change the layout of the bag to suit my travel needs. Inside one of the exterior zippered compartments is a set of four pockets with stitched bottoms. In the other compartment, you will find four sleeves with open bottoms. This sleeve construction was also used in the Filson 257 computer briefcase, but has recently been changed (due to customer demand) to closed-bottom pockets. I am not sure whether Filson intends to also change the layout of the Sportsman’s Bag, but my particular bag has the sleeve/pocket configuration, which certainly provides more options. Located on each end of the Sportsman’s Bag, there are two generously sized pockets that will transport 1-liter water bottles with ease. The intended use for this bag, is as a case to haul hunting/camping/fishing gear and it is at this task that it excels. There are as many ways to seperate and store your gear as there are potential users for this bag. Zippers, pockets and sleeves are literally everywhere and it makes finding exactly what you need fast and efficient. The Sportsman’s bag also makes a great carry-on for certain travelers. In general, I stick to my recommendation that the Filson Medium Travel Bag 246 is the best all-around carry-on, but if you would prefer to trade some space in the main compartment for better organization, than the Sportsman’s bag would be a great alternative. Keep in mind that the exterior dimensions of the two cases are very similar when full, so it is personal preference which style you choose. There is one drawback to the Sportsman’s Bag that I want you to be aware of. The zippers are very rugged and can be quite sharp when the bag is left open. If you are not careful, the zippers from the side compartments can chew up the bridle leather handles a bit. The easiest solution is to flip the front handle down and roll the lid if you plan to leave the bag open in order to prevent this type of wear/damage to the handle material. I find this case to be very comfortable to carry over the shoulder, with one caveat…try not to stuff the compartment closest to your body to maximum capacity. I tend to put softer items in this compartment to prevent the case from standing off my hip too much. I also keep computer chargers, my cell phone and any other non-clothing items in pocket furthest from my body. At full capacity, I still find the Medium Travel Bag 246 to carry a little better. The Sportsman’s Bag is one of the most unique pieces that Filson makes, because it can be configured to suit many intended uses with the internal divider system and its plethora of pockets and sleeves. If you want a great carry-on for short weekend trips, but need more integrated organization than the Filson Travel Bag 246, the Sportsman’s case makes a great option. Bottom Line: the Filson 266 keeps your stuff well-organized and ready for action. I highly recommend adding it to your collection. Great review of the bag. I’m in the market for a bag like the Sportsman’s Bag. I’m curious to know if the end pockets would fit an iPad. Additionally, how is the bottom of the bag constructed? Thanks for your question…the Sportsman’s Bag is a very versatile bag. Fitting an iPad in the end pockets would be a very snug fit and as the main compartment gets fuller, the pocket would bend in such a way to make it unworkable. This would be even more true if your iPad is any type of case or sleeve. So I would say…no to your first question. The bottom of the bag is single-ply rugged twill. There are no feet or leather on the bottom of the case. I hope this helps and if you have any other questions, please don’t hesitate to ask. Do you know the volume and the weight of the sportman and the medium travel bags ? Filson should give these specifications like red oxx,tom bihn…do. I am sorry, I do not know the weight of either bag. I can tell you that the Sportsman’s case is marginally heavier because it offers many more zippers, dividers and compartments. The volumes would be easy to calculate roughly by using the dimensions from Filson.com, but the Medium Travel Bag (in my estimation) has a lot more room because, not only is it larger, but the main compartment is entirely open and not subdivided, which gives you more flexibility. Sorry, I could not be more specific with my answers, but I hope that helps a bit. Hi, I currently have a ‘Medium Field Bag’ as well as a ‘Sportsmans Bag’. I purchased both as carry-on luggage. (non-business travel). I found the Medium Field Bag unsuitable as it leans away from the body, and is a pain to unbuckle and get into. I do use it for upland hunting, and trap shooting to carry cartridges and extras, and it is suitable for this. I find the Sportsmans bag to be better as carry-on. Unfortunately, it ‘stands off’ the body when packed full. The closer pocket must be left near empty to be comfortable. It is best carried in the hand. I am currently looking at either the 257, or 258. I would use this strictly as an airline carry-on, as I don’t need one for business, books, or files. Do you think either would excel for this function, and which would you choose? I like the versatility of the extra pocket on the 258 for passport, tickets and ‘quick’ items) I’ve never handled either bag. Would the dividers be beneficial, or detrimental? Also, is the padding intrusive on the 258? (I don’t really require it). Hi Karl, thanks for visiting the site. I have not owned a 258 in person, but I have handled one at length at my local dealer. The 258 is substantially larger and heavier than the 257. I agree with your assessment of both the Medium Field Bag and the Sportsman’s Bag. If you are looking for an airline carry-on either bag would work, but I would lean toward the 257 because I usually default to the position that smaller and lighter = better for most purposes. If you are looking for a larger bag that would need to be stowed in the overhead compartment, it is hard to beat my favorite travel companion…the Medium Travel Bag. It has the same exterior dimensions as the Sportsman’s Bag but provides a more “open-concept” layout with nice quick-access pockets on the outside for tickets, passports, a newspaper and a bottle of water. Thanks for your help. I couldn’t wait, so I ran out and purchased the 258. I actually looked at the entire Filson line, including the Medium Travel before settling on the larger Padded Computer Bag. The interior dividers can be conveniently pushed aside to allow the bag to be stuffed with clothing, shoes or other ‘non-book’ items. The side pocket has the small pockets for phone, GPS, passport, etc. My Sportsman’s bag will now be my trapshooting bag, and I can use the Medium Firld as my ‘field’ cartridge bag. 5. Steel Water bottles in end pockets. 8. Change, pens, paper, notepads, etc. 9. Any other odds and ends I may need that day. The bag fits nicely in a front or back seat and it very handy when you are on the go. I would highly recommend the bag. Thanks for your comment and for sharing your daily load out! It is definitely one of my favorite Filson bags…super versatile. I thought I would comment as I have used the Sportsman in at least a half-dozen overseas trips. I think the bag is brilliant for international travel as there is a place for everything in the 6 external pockets without having to have separate mesh bags or pouches. And 4 of these pockets are either “secret” or zippered. Large outer pockets – like on the medium travel bag – are fine for casual travel but I feel don’t offer enough security for airline travel where you might store phones, passport, travel documents, or your electronics when your bag is going through the the scanner at TSA or a row ahead of you in the overhead bin. The Sportsman is not an ideal one bag/one world design for longer than a 2 or maybe 3 days as the central compartment isn’t very wide, but in tandem with a checked roller bag or garment bag to haul your clothes, it is perfect. I also don’t heavily load the side pocket near me and I covered part of the handle with tennis wrap to prevent “zipper bite”. Can’t say enough good things about it, really. Thanks for your detailed review…I found your comments very valuable and appreciate the feedback…I agree with your assessment!